It's a loose interpretation, to be sure, from Kathryne Taylor's Love Real Food. Besides swapping in those chickpeas, she skips the cream in the sauce and uses coconut milk – like chickpeas, a beloved ingredient in India. Is it heresy to strip a traditional dish of so many essentials? I don't think so, especially in this case, because chicken tikka masala, according to most sources, is itself a loose British interpretation of an Indian favourite. Accounts vary, but in the famous 2001 speech in which he declared it "a British national dish", former foreign secretary Robin Cook said the masala sauce was added to India's chicken tikka "to satisfy the desire of British people to have their meat served in gravy". For those of us who desire nothing more than an easy, quick, spicy, satisfying, plant-based curry, tradition can give a little. And so can the name. This vegan take on the British-Indian staple of chicken tikka masala uses coconut milk instead of cream. Adapted from Love Real Food by Kathryne Taylor. 1. Pour the tomatoes into a blender or food processor and puree until smooth. 2. Heat the oil in a large skillet or casserole dish over medium heat. Once the oil shimmers, add the onion and salt. Cook, stirring occasionally, until the onions are soft and translucent, about five to seven minutes. 3. Add the ginger and garlic and cook until fragrant, about one minute. Add the garam masala and cayenne, if using, and cook, stirring constantly, until fragrant, about 30 seconds. Add the pureed tomatoes, chickpeas, coconut milk and the half cup of chopped coriander. Taste, and add more salt if needed. 4. Increase the heat to medium-high; once the mixture begins bubbling around the edges, reduce the heat to low to maintain a gentle bubbling. Cook, stirring occasionally, until the sauce thickens and the flavours meld, about 20 minutes. 5. 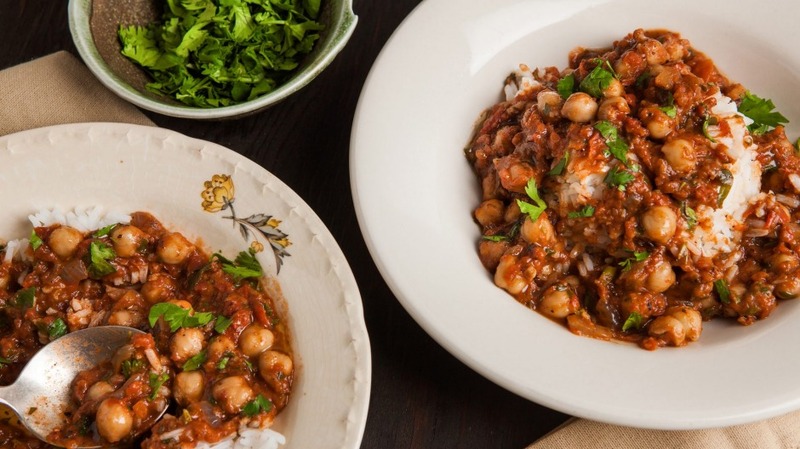 To serve, spoon the rice into individual bowls and top with the chickpea masala. Sprinkle with more chopped coriander. Or try Karen Martini's recipe.